Despite the daylight hours being shorter and the weather being harsher, winter camping has numerous rewards which cannot be compared with any other season. In as much as it might seem daunting if you have never winter-camped before, by simply having the right gear and making enough preparations, you can be able to enjoy the magnificent beauty and solitude which comes with snow camping. To ensure your success, there are things that you should essentially be aware of when planning your trip. As appealing as the empty wilderness might be, nature can at times be very unforgiving. 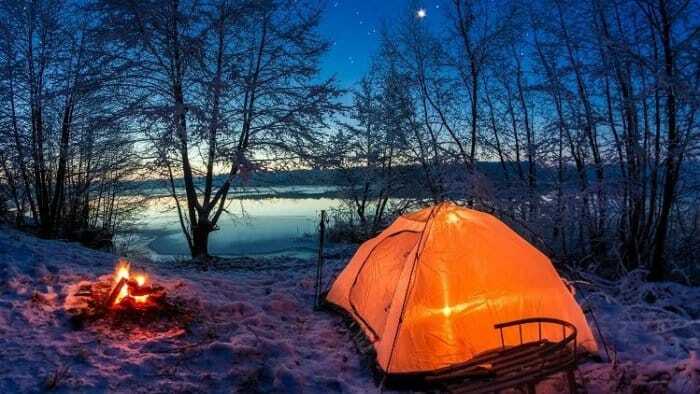 It is for this primary reason that you should ask a friend or two to accompany you who have at least done winter camping before such as making shelter, navigating through snow and finding routes. You should also make an effort to study the land’s layout. Physical maps can be able to show you the lakes, rivers, mountains as well as their elevations. Additionally, you can see the roads and with the scale in the map, you can ascertain the time duration for your trip. Check also the trail and the road conditions. What are the views of those who have camped in the area? Are there support businesses? Further, what emergency services are present and how long would it take them to come to your rescue? However, if you plan on going to deep snow sections, it is best that you learn how to recognize and avoid the dangerous avalanche zones. You can check this on avalanche forecasts. It is important to notify people of where you’re heading to and when you expect to come back. This information should include your vehicle’s details as well as the names and contacts of your fellow snow campers. This will help you avoid merciless storms. 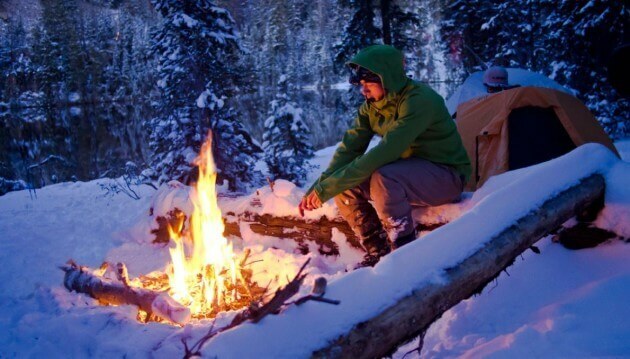 One of the tenets of winter camping is that you should always stay dry and warm. To achieve this, you should wear layers of insulation which will wick moisture and provide you with the weatherproof you need while still allowing you to breathe. Ideally, you should go for the best family tent which is the 4-season tent which will be slightly heavier than the standard 3-season tent. This is because the 4-season tent will offer you better wind and snow protection. Thus, you should search for a dome-shaped tent with extra-sturdy poles and guy lines which will increase stability during the windy conditions. Further, you should choose strong solid fabric rather than mesh, dual doors for ease of access and a huge vestibule for wet storage gear and sheltered cooking. Winter camping tents main part for camping. You should go for a winter sleeping bag which has been rated for 10 F below the coldest temperature. If it gets too warm, you can open it up. Further, to keep the interior of your bag cleaner, you should add a sleeping bag line as well as self-inflating sleeping pads and a closed-cell. 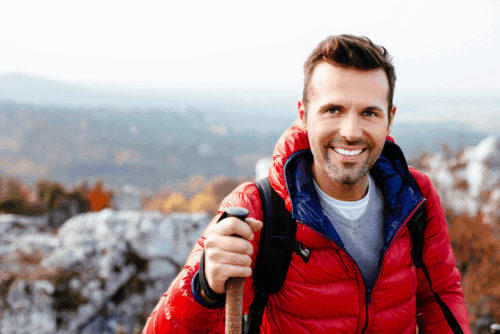 Even though you are simply going for a short hike, you should have a backpack with a first-aid kit, water, compass, maps, camping knife, a fire starting kit and packaged food rations. A small pot and a pocket stove can help you melt the snow for drinking water. Additionally, if you are carrying snowshoes or skis, you should ensure the pack has tie-on points for protection. Instead of carrying a flashlight on your hike, you should wear a headlamp to keep both your hands free. Further, since winter camping nights tend to be longer, ensure that your batteries are fully charged or new prior to your trek and always have extra. To be able to keep in touch with your fellow members in your expedition, you need to have 2-way radios since mobile phone service in these areas is almost non-existent. You should get models which tout ranges above 10 miles. Two of the most essential items to have when hiking or trekking particularly when the weather is bad or there’s snow are a compass and maps. These are very crucial since your destination or trail can get obscured. This means that you should make a concerted effort to learn how to use them as you cannot rely on GPS alone. Half of the food you carry should be carbs because they convert easily to energy and help keep you warm. 30% of your camping food should have this. Although they take longer to convert and generate heat, they will enable you to generate heat over a greater time period. Only 20% of your camping food should be proteins. These meals will help build your muscle tissue and satisfy your hunger so that you are not easily worn out when engaging in your favorite outdoor activity. Even though it might not make sense at the moment, you can actually get dehydrated and not realize it despite being surrounded by snow. To ensure that you are not dehydrated, you should make some warm, good-tasting drinks like soup, hot cider and cocoa and drink it in plenty. As you plan to go for your snow camping, you should also endeavor to find out if your favorite spot is actually open. This is essentially important as you do not want to be disappointed by a “closed” sign because the region you were going to has deep snow. Should one or more of the people you are camping with start becoming very lethargic or cold or if their speech pattern starts slowing down and thickening, then hypothermia might have started creeping in. For this, you should immediately stop and set up camp. Thereafter, you should get them into a sleep bag and give them something warm to drink immediately. This is because hypothermia can be very deadly. Thus, ensure that you are always looking for these signs. 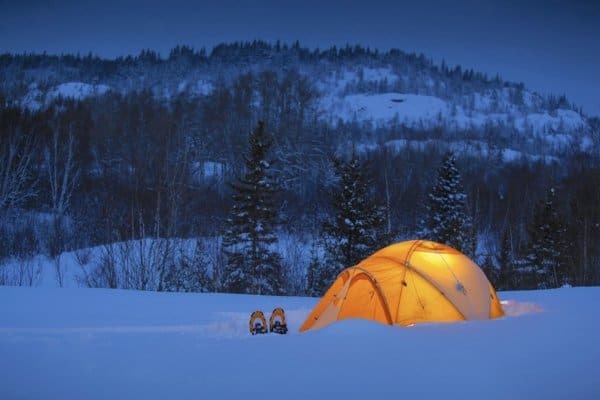 Generally, winter camping revolves around awareness. This is why it is very important to be knowledgeable and always be prepared for the worst as it can help you cope when things change. Above all, you should always ensure to have the best family tent so that you can quickly have shelter should hypothermia set in.